Watch your favourite video songs and movies in video player. It supports MPEG4, H.263, H.264, DivX, WMV, AVI, 3GP, MKV file types. Listen to your favourite songs in music player. It supports MP3, AAC, AAC+, AAC++, WMA, AMR, MIDI etc. file types. The LG Optimus 3D Max and the original Optimus 3D are so much alike you may have trouble figuring out the differences. Minor changes can sometimes make a big difference but one particular difference is not so hard to notice and, to us, it may as well be the decider in favor of the 3D Max. The sequel is notably slimmer and lighter than the original, so there's proof that handheld 3D viewing can come in a compact package. On its own, the 3D Max is a solid dual-core phone with some neat NFC-enabled features. But the hiccupping 3D feature, although cool, is a drag. 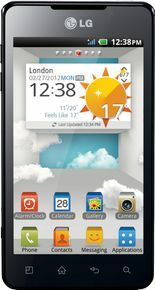 The LG Optimus 3D Max has a speedy dual-core processor and a crisp display, and it's equipped with an NFC chip and tag stickers. The LG Optimus 3D Max's display has a narrow viewing angle when in 3D mode, and the 3D software is still buggy. Also, until an upgrade comes you're stuck on Android Gingerbread.